Pupils from year 3 and 4 have been learning the violin and ukulele. The children are showing dedication and talent in learning to play a musical instrument and look forward to sharing their newly-learnt skill at up-coming events. Since Spring 1, the KS2 choir have been learning vocal techniques and singing songs with Miss Powell and Mrs. Ealy during lunchtimes. The children have so far learnt some traditional gospel songs, 'Ain't no mountain High Enough' and most-recently, the well-known Trolls soundtrack 'Can't stop the Feeling'. Come and join the friendly group of singers on Thursdays from 12.45-12.15 in year 4 classroom. Year 3 have been learning to play the African Djembe drums in their music lessons this half term. They have been developing skills in playing rhythmic patterns using a variety of drum strokes and have learned to sing and accompany some traditional songs from Africa. They have also worked in small groups to compose their own music. They are working well as a team and sound great! The year 5 spring term music concert has been rescheduled and will now take place on Wednesday 22 March at 9.10am. We apologise for any inconvenience caused. Well done to the children in years 4, 5 and 6 for their expressive singing in the Christmas production this week. Congratulations also go to the children in the orchestra for their performances of 'Halle, Halle, Halle' and 'Silent Night'. Well done to the children in years 1, 2 and 3 for their fabulous Christmas performances this week. The children performed 'Lights, Camel, Action!' by Antony Copus. The children learned a varied mix of songs for the show and each class prepared a dance routine. The audiences were treated to a wonderful extravaganza of fantastic singing and dancing. The Academy is fortunate to have two choirs. Children in years 4,5 and 6 are invited to join the Upper Primary Choir and children in years 1,2 and 3 are able to join the Lower Primary Choir. Both choirs are sounding great this half term. Upper Primary Choir have been learning a variety of songs including 'Somewhere Over The Rainbow' , 'OK' and 'Rocking All Over The World'. Lower Primary Choir have particularly enjoyed singing 'The Doodling Song', 'Sing Of A Rainbow' and 'Stripes and Spots'. Year 5 and 6 children were very fortunate to have a visit from Ray Sidney on Tuesday 13 September. Ray is a gospel singer from the United States who travels the world sharing his love of gospel music. The workshop was a wonderful experience for the children and was musically stimulating and great fun. The hall was filled with fantastic singing from Ray and the children. It sounded amazing! Many congratulations to the year 5 and 6 children in the orchestra for performing so well together in the concert today. The concert included a variety of arrangements of song tunes from around the world. The children performed an arrangement of 'Si Si Si' from Africa, 'Yellow Bird' from the Caribbean, a folk tune from Germany and a beautiful piece from New Zealand called 'Polkare Kare'. Many congratulations to both the school choirs for their wonderful performances at the Freemantle Music and Arts Festival last week. The theme for the festival this year was 'Light'. The song 'My Lighthouse', which is one of the school's favourite songs, was sung at both concerts and was a particular highlight. There were many positive comments from the audience afterwards. Not only was the singing fantastic but the choirs also raised money for Naomi House and Solar Aid through their performances. The choirs raised a total of £74.24. Congratulations to the year 5 children for their beautiful and moving singing during their class assembly. They sang a song about love and forgiveness called 'This Is Our World' by iSingPOP. Well done also to the year 5 ukulele players for performing together brilliantly and demonstrating some of the skills they have gained since starting this instrument in September. Well done to the year 4 violinists for their fantastic performance at the 'In2Music' concert. The children have worked really hard this year and have made super progress in learning to play the violin. Many congratulations to the year 4 clarinet players for their wonderful performance on Monday at the 'In2Music' concert. The repertoire for the concert included the 'Japanese Frog Song', a welcome song from Africa called 'Funga Alafia' and 'Tinga Layo' which is a song from the Caribbean. The children were able to demonstrate their skills in improvisation as part of a performance of 'Watermelon Man'. A particular highlight of the concert was a performance of 'I Feel Good' which brought huge smiles to the audience. The children also played 'Frere Jacques' as a two part round on their instruments and 'Ode To Joy' by the famous composer Beethoven. What an amazing concert. Well done everyone! Our year 2 children had the wonderful experience of listening to live performances from the world renowned Orchestra Of The Age Of Enlightenment at the Turner Sims Concert Hall on Friday. The repertoire for the concert included pieces by the famous Baroque composers Vivaldi and Handel. The children performed a sea shanty with actions, joined in with a body percussion hornpipe and also sang a song about the water cycle which was accompanied by the orchestra. Congratulations to the year 5 and 6 members of the Upper Primary Choir for their wonderful singing at the Marlands Centre on Friday. The children sang a variety of Christmas carols and songs and raised £45.35 for the RNIB. Well done everyone! Many congratulations to the 23 children from the Lower Primary Choir who sang together with pupils from other schools in Southampton at the Guildhall Christmas Concert on Wednesday evening. The children sang songs from 'Baubles!' by Antony Copus. It was a wonderful evening of music and the singing was beautiful. Well done everyone! A huge well done to the year 5 clarinet players and violin players for their wonderful performances in the concert today. You are amazing! Keep up the good work! 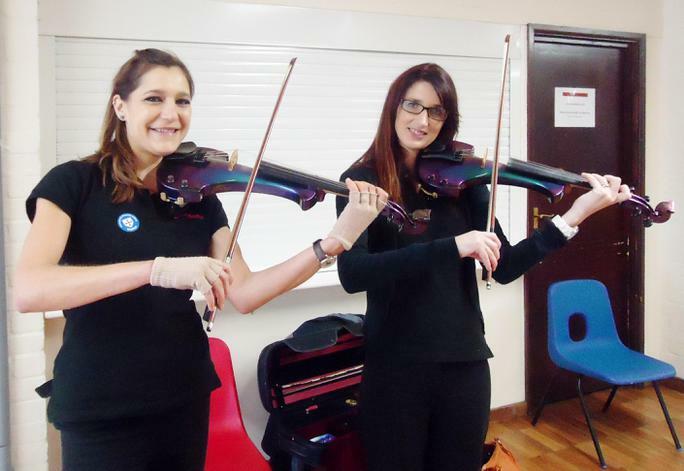 Our Key Stage 2 pupils had a wonderful time listening to a performance by Emma and Patricia who are members of the electric string trio called Cordelectra. "Thank you for coming to our school. I loved your concert and your playing was magical." "I thought it was epic. I especially liked the part we joined in with." "It was an amazing experience and it was very entertaining. On top of all of that, it was a lot of fun and I would like to do it again." Our year two pupils had lots of fun on Tuesday 3 November taking part in a music workshop led by Hetti and Susie from the world renowned Orchestra of the Age of Enlightenment. The children learned a new song about the water cycle and also joined in with a sea shanty and a body percussion hornpipe. 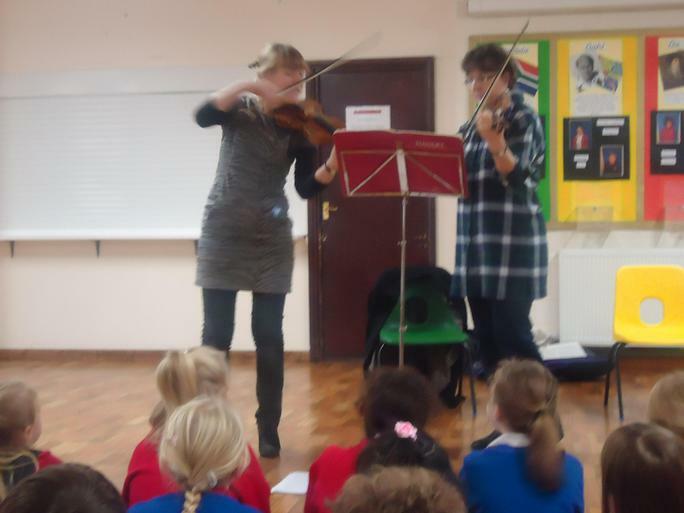 Hetti and Susie also performed part of Handel's Water Music on their violins.